When I was younger, I couldn’t get enough of the outdoors. This was especially true in the spring. There was something truly intoxicating about the season—the warm, freshness of the air, the way plants and wildlife reappeared after months of snow and ice. It seemed miraculous that the earth could go through such an incredible transformation over the span of just a few weeks. I used to make up any excuse I could think of to get back outside. I’d help my mom in the garden. I collected fallen branches and placed them in our fire pit for future bonfires. I’d sit on our porch swing to read until the sun started fading into a darkened sky. These days, I still try and spend as much time as I can in nature when the weather is right—even if that’s just taking my latest project out to our deck where I can work on my piece with birds singing and bumble bees buzzing in the background. Don’t get me wrong; I enjoy crocheting on the couch as much as anyone, but it never leaves me feeling as invigorated as an hour outside does. The energy of the season inspires me to do more: finish all those projects on my to-do list, spend time with friends, clean out (and organize) my yarn stash, but more than anything, it makes me eager to find new projects that will be as fun to wear as they are to crochet. 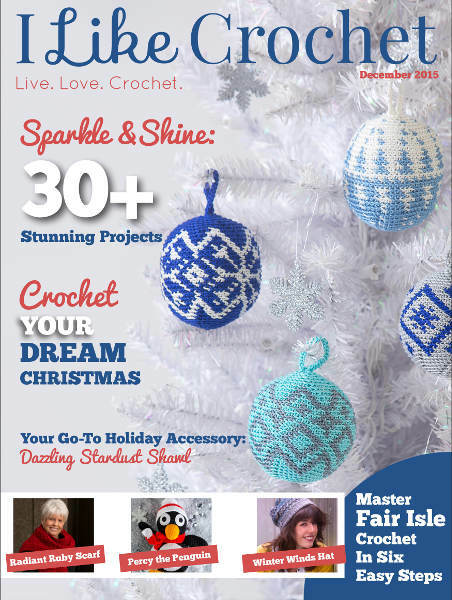 To help get you started, we’ve selected some absolutely stunning designs for this new issue. The Fairytale Shawls might be my favorite collection to date. Elegant, airy and fit for royalty, each shawl is ideal for the season and can easily be dressed up or down. Can’t wait to get ready for Easter? We’ve also included some ultra-cute projects for little ones, from adorable clothes to toys and baskets. We also haven’t forgotten about Mom. Treat her this Mother’s Day by crocheting a new scarf, eyeglass case, shawl or classy pillow — we have a project to suit everyone’s tastes. 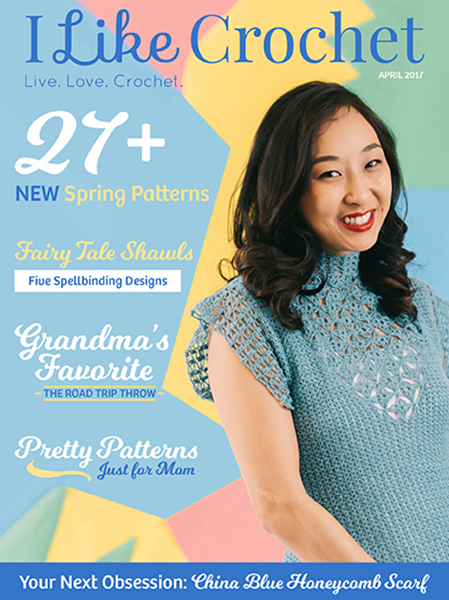 And to all you vintage lovers, our Crochet Classics section features new designs inspired by traditional accents, shaping and color. With a vibrant dress, a 70s-inspired tote complete pony beads and the gorgeous Postcard from Spring T-Shirt, you’ll love reliving these blasts from the past with modern twists.